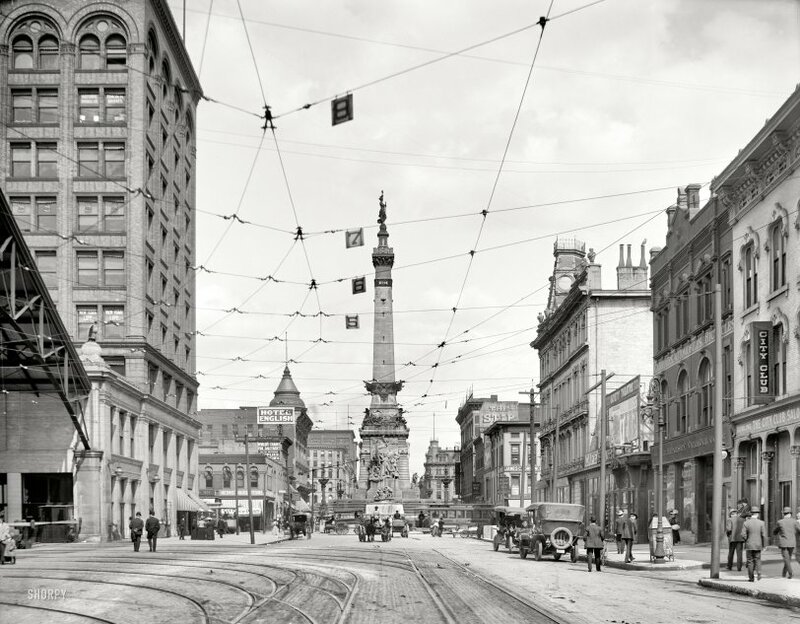 Indianapolis, Indiana, circa 1907. "West Market Street." Another view of the Union Terminal building and car barn seen in the previous post. 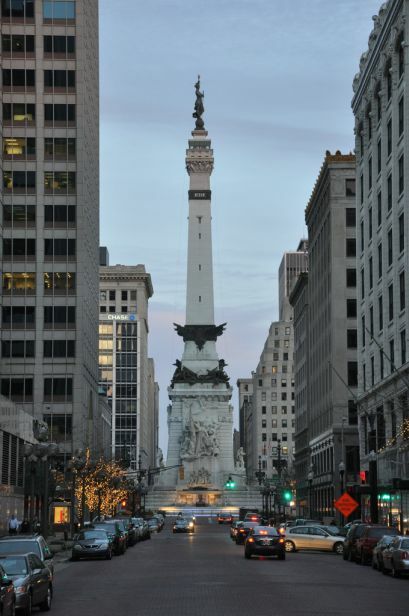 Points of interest include the 1902 Soldiers and Sailors Monument, the Hearsey Vehicle Company to the right (dealer in gasoline, steam and electric automobiles) and, farther down the street, medical offices of Dr. Gasaway & Co., "specialists." View full size. Submitted by LaurencePaul on Wed, 03/30/2011 - 9:17pm. I would love to know what the two men in bowlers strolling down the street on the left are talking about. Or the two men in the doorway on the right. Most fascinating. Submitted by Lectrogeek68 on Tue, 03/29/2011 - 6:24pm. The steel (railroad) kind, of course, not the amphibious kind. Also interesting to see the carbon-arc lamps on counterweighted booms, rather than the usual block-and-tackle. Submitted by SignpainterJeff on Tue, 03/29/2011 - 5:17pm. Now that Sir is a marvelous monument, what a tribute. The colour version as of today just seals it for me, thanks Revelator. I'm glad there's a Hotel English for me to stay at as my American ain't too flash. Submitted by Michael R on Tue, 03/29/2011 - 3:42pm. 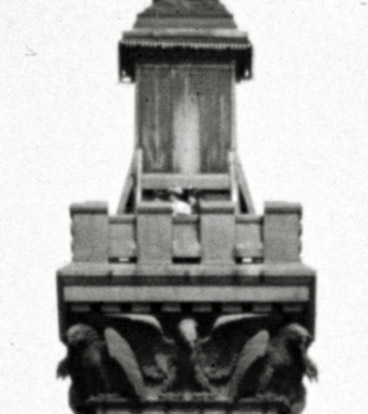 The 1887 design competition for the Indiana Soldiers' and Sailors' Monument was won by the German architect Bruno Schmitz; the monument was completed in 1901. This monument is actually quite restrained compared to Schmitz's later designs for war monuments in Imperial Germany, most notably the Voelkerschlachtdenkmal (Monument to the Battle of the Nations, where Napoleon was defeated in 1813) near Leipzig, which was completed in 1913. Submitted by Revelator on Tue, 03/29/2011 - 11:14am. The Soldiers and Sailors Monument today. Submitted by Greycat on Tue, 03/29/2011 - 10:54am. It looks like someone, perhaps even a couple, if my old eyes are correct, has made the dizzying climb up the stairs inside the monument's tower. I am left to wonder if Dr. Gasaway was an internal medicine specialist. Submitted by Stu Neros on Tue, 03/29/2011 - 10:33am. Check out the crazy "viewing platform" for the statue!